I recently did a wedding photo shoot. My camera is a NIKON D80 AF-S Nikkor 18-135mm 1:3.5-5.6 G ED. The church lighting was very very dim that day. It was more like a catholic church, and candles were the only illumination. The biggest f/stop I could get was f 3.5, and when I zoomed in for close ups, the f/stop lowered, making my pictures darker. I couldn't get the shutter speed lower than 100, because the motions would blur. So I was kind of trapped and didn't know what to do. I couldn't raise my ISO any higher than 800 because of noise. And my EV was already like +5.0. Um, So, what do you usually do if you have so little illumination at a wedding? Do you think I should have bought a wider angle lens to enhance my f/stops? Tripods? (but I don't know how I can use a tripod and still move around at a wedding.) Flash? But I also remember you didn't use a flash at Faith's wedding. Did you just use lens that had bigger f/stops? Like f1.8??????? I also remember that at Faith's reception the lights were pretty low, too. So, I'm just curious how you managed there? Was it because of the reflector that Jocelyn was holding? Or was it also a wide angle lens?????? •	Use a flash – no one likes this. •	Use higher ISOs – Yes. ISO noise is evil. Dark, blurry photos are MORE evil. 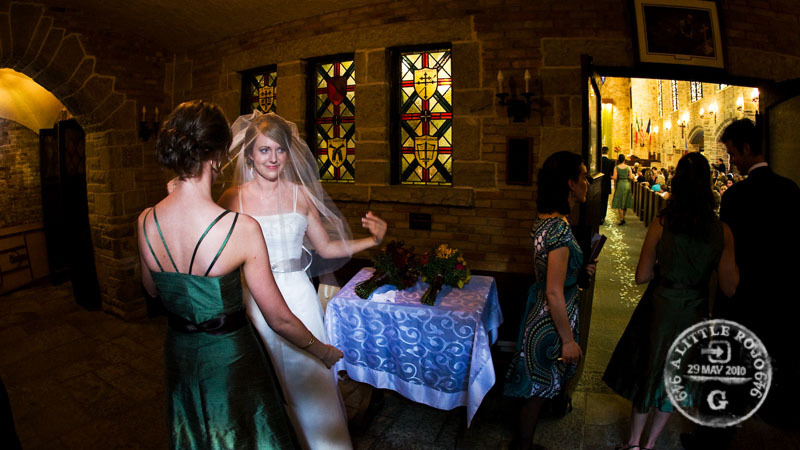 I will shoot weddings at ISO 1600, 3200 or even higher if that’s what is needed to create a good image. I would much rather have a sharp picture with adequate light and a bunch of noise than a nice smooth image that’s way too dark. Shoot in RAW. Do your own processing. The newer the camera the better the noise levels will be. During a wedding there are some events that you don’t have any control of, but there are a lot of photo ops where you can move the bride and groom into better lighting. Take the initiative to find good light and use it.